Called to live in the world, but not to be of it, Christians must maintain a balancing act that becomes more precarious the further our culture departs from its Judeo-Christian roots. How should members of the church interact with such a culture, especially as deeply enmeshed as most of us have become? D.A. Carson applies his masterful touch to this problem. He begins by exploring the classic typology of H. Richard Niebuhr with its five Christ-culture options. Carson proposes that these disparate options are in reality one still larger vision. Using the Bible’s own story line and the categories of biblical theology, he clearly lays out that unifying vision. Carson acknowledges the helpfulness of Niebuhr’s grid and similar matrices but warns against giving them canonical force. More than just theoretical, Christ & Culture Revisited is also designed practically to help Christians untangle current messy debates on living in the world. 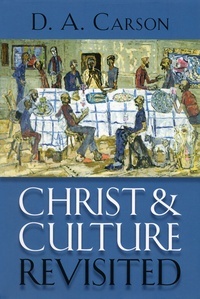 Carson emphasizes that the relation between Christ and culture is not limited to an either/or cultural paradigm — Christagainst culture or Christ transforming culture. Instead Carson offers his own paradigm in which all the categories of biblical theology must be kept in mind simultaneously to inform the Christian worldview.